Get Your Tarot Gear On! Finding practical and comfortable ways to carry around your tarot decks and associated accoutrements can be a challenge. Books, journals, notebooks, handouts seem to be an important part of the experience of Tarot, especially if you are taking a class, going to a conference, or teaching a class. Readers, too, need to have a way to carry it hither, thither, and yon, as my mother says. I also want to avoid looking like a bag lady whenever I can since I seem to have leanings in that direction so I want to complement my style. My style seems to be comfortable and funky. I have some exacting standards about purses and bags. So I decided to make a bag to take my tarot cards and journals about. 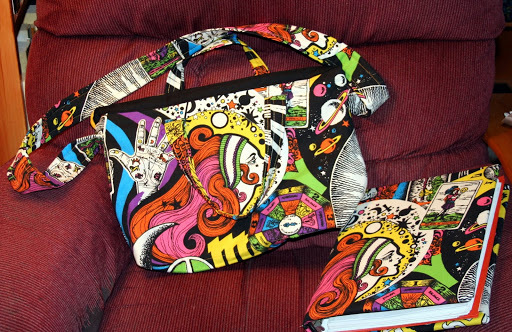 I found a nice bag pattern from Lazy Girl Designs, the Towne Bag. 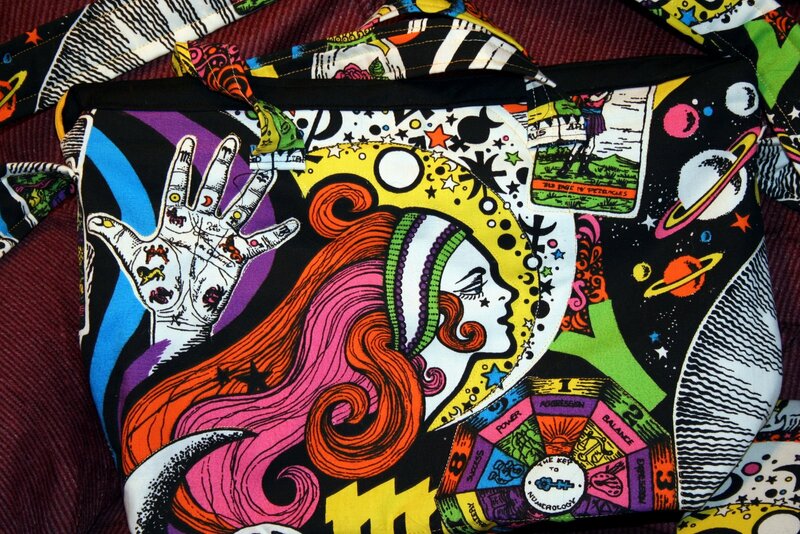 I bought some funky home dec fabric on ebay. This is very Peter Max 1970s heavy fabric. It was fun to work with. I think I’ll do a reading with the Tarot cards on there at some point, they are interesting choices. I had some fabric leftover, so I covered an old binder (reduce, reuse, recycle) with the fabric to hold my handouts from the Tarot School’s Readers Studio. I think it all turned out really very well. My next project is to find the right notebook/journal for taking notes and cover it with fabric, too. So I’m geared up to learn and teach Tarot!!! Last year at this time, I looked at the calendar and realized that Friday the 13th was smack dab on the dark moon. Lucky day, favorite moon sign. What else was I to do. I scheduled my croning for that day. If you’ve read this blog from the beginning, you know that I have struggled a bit with the crone designation. I’ve realized, after all, that it doesn’t have to be all that’s left. The Crone offers out a richness and power that is not limited to that one single concept. It was something I wanted to explore. The ritual was fabulous. Three priestesses, Sci, Phaezara, and Thia Moonstone embodied the Moirae. I had done a number of shamanic journeys, seeking the ancient mothers of the elements and asking their wisdom. In addition, a tarot reading at the Tarot School’s Readers’ Studio gave me a lot more insight into this crone initiation. Each portion of the ritual helped complete the journeys and give me more insight into the Crone. And as I stepped over the threshold, I was greeted by the Crone herself who gave me a shell necklace in celebration of arriving at this strange new shore. It was a wonderful, personal ritual attended by dear friends and beloved witches. Oh yes, and we danced to “The Golden Years,” by David Bowie. And so the journey begins. This month, I passed the thirteenth month without a period. The day fell, not surprisingly, on the Dark Moon. And may the cycles of your life be blessed!!! Luck from the Lady Tonight! Luck from the Lady Tonight!! That got me thinking about what is luck? Is it random acts of kindness and hostility by an indifferent Universe? Is luck something that can be cultivated and grown? I believe it’s the latter. If you look at the big picture–and I mean the hugest picture–then everything, even chaos has a pattern and a purpose. Energy moves with purpose. Luck is another form of energy and if you can figure out how to move with its flow, then you have good luck. If you move against it, then your luck is less than auspicious. Off on and on for awhile, I’ve had a thought. I don’t have a pentacle for my altar. Maybe I should shop for one or make one. The thoughts were fairly fleeting and I never devoted much thought to it at all except every once in awhile. In April, my coven [the one I’m in] had this absolutely fabulous day where we met for lunch, shopped, and ended up at the house for two rituals; one ritual was the dedication to the coven of two really terrific people and the other a full moon ritual. It was a memorable day. The husband of one of us makes these lovely stone carvings and she brought me an example of the stone so I could see if it was something I wanted to have a heron carved in for the coven I high priestess. The example was a lovely pentacle carved into the stone. After everyone left, I realized that she had left the pentacle behind, so I emailed her and told her that I’d bring it the next time we had a gathering. She wrote back to say that she left it behind as a gift and thank you. I was so excited to get another wonderful gift from these fabulous people, but also because my random wishes turned lucky! On another day, I was watching television and saw pictures of my Alma Mater, the University of Maryland [Fear the Turtle] and said to Mouse, “I haven’t been there in more than 25 years. I’d like to go back and see what they’ve done to the place. It’s just that everytime I go home to Maryland, I want to go to the eastern shore to see family and the ocean. A vacation trip to UM is a little lame. Later, at work I was thinking that I need to update my knowledge on copyright since I work with intellectual property all the time. Then I’m reading my email and get a notice of a conference on digital copyright. Guess where? You guessed it, the University of Maryland! How cool is that. Last month I won two drawings in two different places. I was at a gathering held at a friends’ BnB and the prize was a one-night stand–er, stay–in their deluxe suite. They pulled ticket after ticket and no one had it. I wasn’t even thinking about it, and I won!! We haven’t gone yet, we’re saving it for a very hot summer’s day. The other time was at the Tarot School’s Readers’ Studio. They instituted a new thing at the end of the session, drawings for donated prizes. And I won a complete set of Llewellyn’s Special Topics in Tarot. Eight books by Mary Greer, Nina Lee Braden and others. Very fabulous. Now you’re thinking, oh she’s just lucky and I’ll never get that lucky. Yes I am lucky, partly because I stopped giving strength to negative statements like “oh I never win anything. It’s one of the most important lessons I learned at Akasha Con. Something I’ll write on a little later. So if you think lucky, you will get lucky. And everybody wants that.